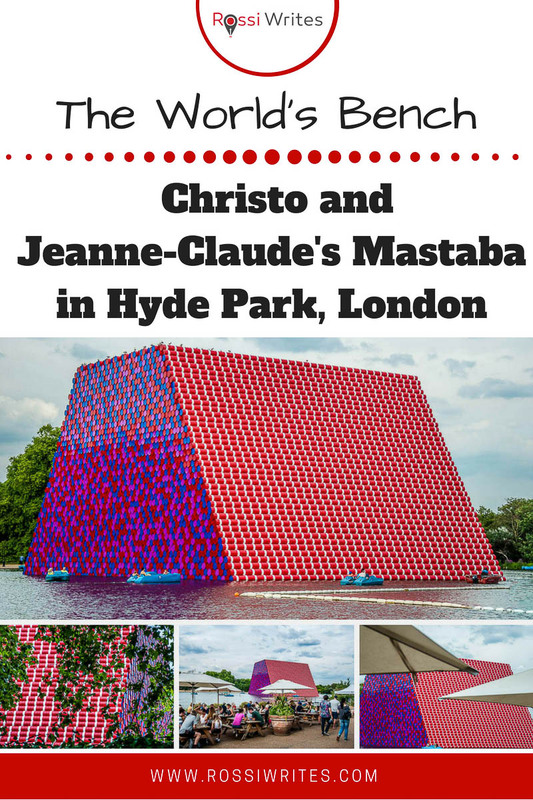 The thing I really wanted to see this summer in London was Christo and Jeanne-Claude’s latest art project. 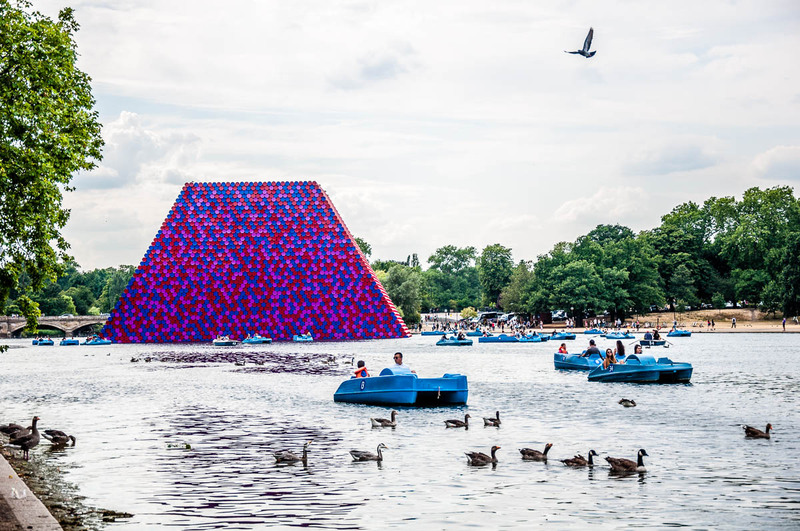 Called The London Mastaba, the brave and bold truncated shape (a quase-pyramid but not quite) has been floating on the waters of the Serpentine lake in Hyde Park since June and will remain there until 23rd of September 2018. Even though I try to steer clear of London as much as possible (too noisy, too populous, and too superficial) during our yearly two-week trips to the UK, in order to see The London Mastaba for myself, I was happy to brave the London tube and train system once again. Two years ago I had the chance to see Christo and Jeanne-Claude’s The Floating Piers on Lake Iseo in Northern Italy. It was an extraordinary experience – a once-in-a-lifetime chance to walk on water, lie on water, sit on water, be as close to the movement and texture of water without actually getting wet. So, I was curious to see what effect the new creation of one of the world’s most celebrated artistic duos would have on me this time. This is how in the third week of July and in the midst of a heatwave that had gripped Britain and parched its traditional green lawns to dry yellow patches, we found ourselves in Hyde Park after a quick journey on a tube train where everyone was zealously guarding their personal space. In and outside of the tube station it was hot. Very hot, indeed! Almost as hot as in Italy, which is to say something. People were crowding Hyde Park, whole families sitting on the dry grass, mummies and daddies walking with their children in tow, and couples out and about on a romantic stroll. Benches and deckchairs accommodated people who were sunning themselves and chatting in quiet voices in a multitude of languages. Ducks and geese, pigeons and one regal heron flapped their wings around and above us. 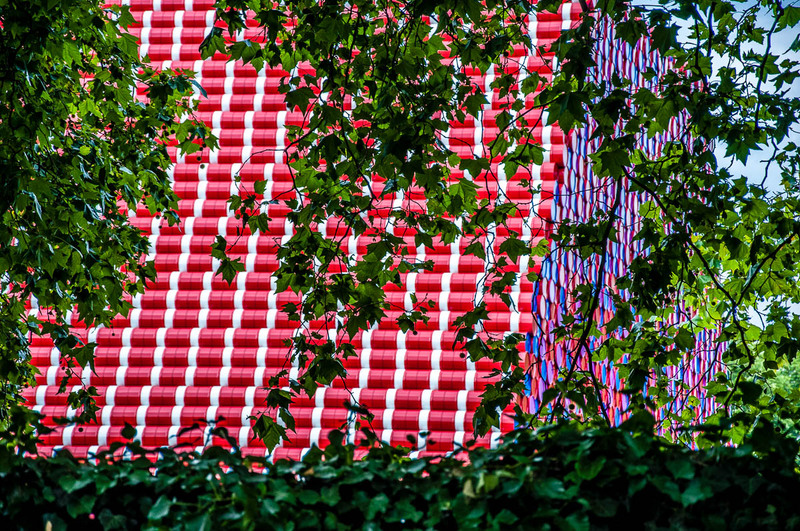 And in front of us, in stark contrast to all the green trees, yellow grass and colourful hubbub, stood The London Mastaba – a huge shape made of barrels painted in red with white stripes on the front and pink, red and blue on the sides. 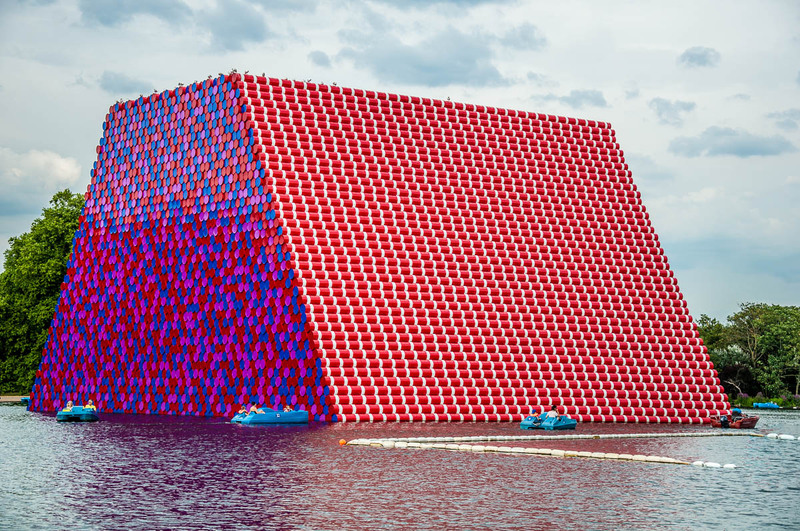 Unlike the Floating Piers, there was no easy access to The London Mastaba. We couldn’t walk on it like we did on those orange walkways that stretched for kilometres over the 90 metres deep Lake Iseo. 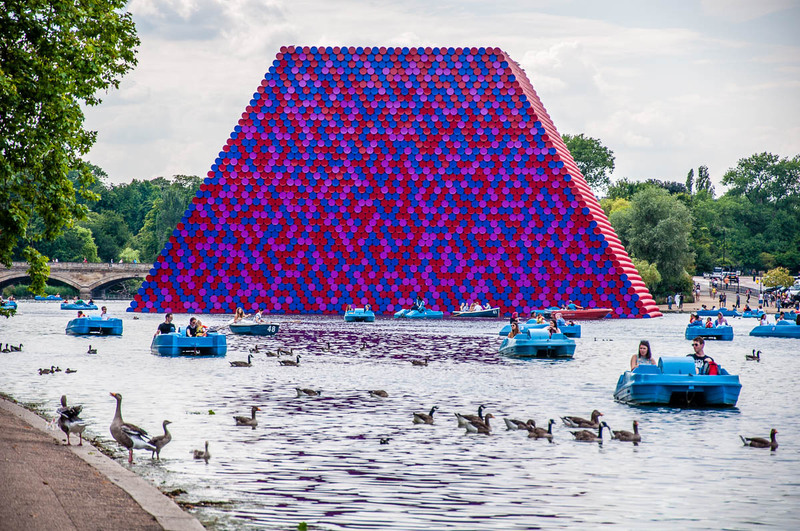 We couldn’t touch The London Mastaba either, as it is moored in the Serpentine lake and it is surrounded by water on all sides. We were in no mood to hire a pedalo or a boat. 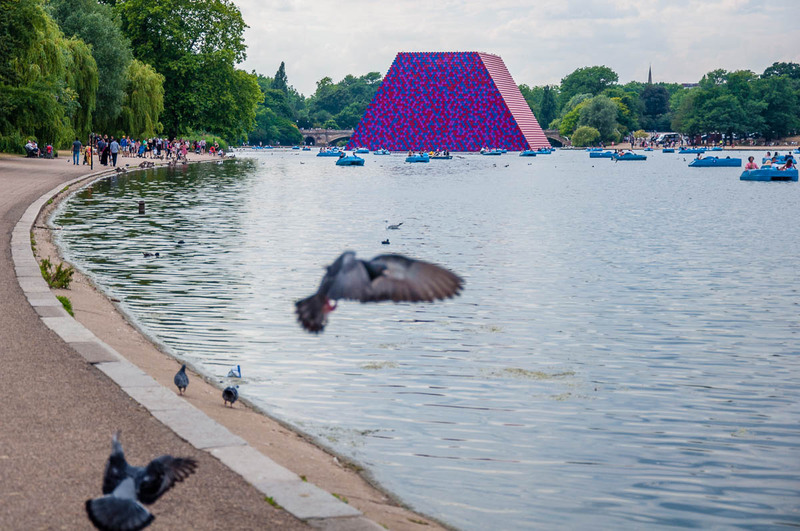 As for sitting on The London Mastaba, this privilege was strictly reserved for the pigeons and seagulls which were observing us carefully from their high vantage point. 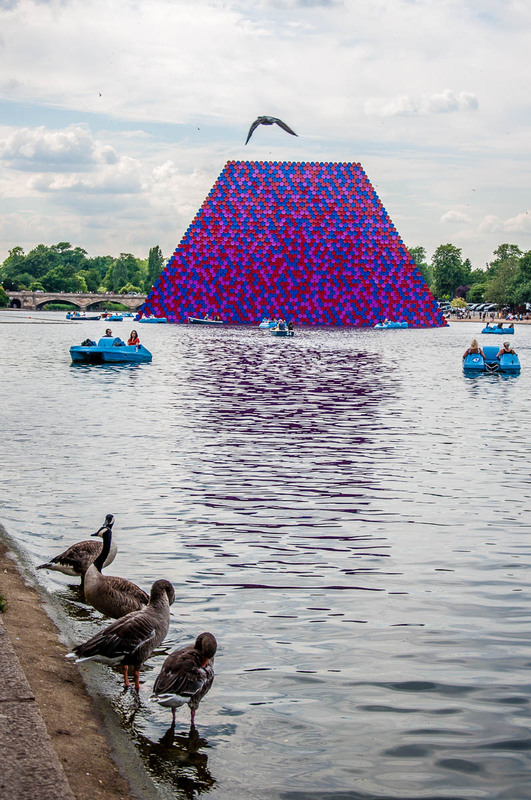 Had it not been for its bright colours, The London Mastaba would have sat there in the middle of the lake, totally aloof. 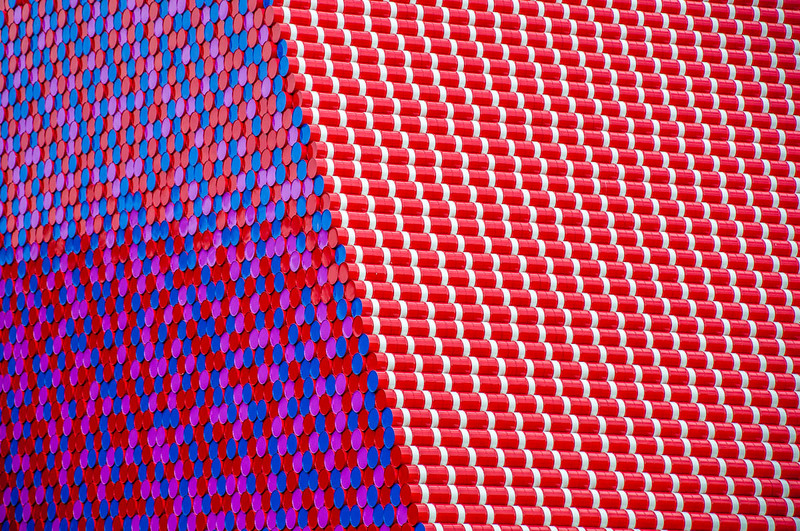 Thanks to its fabulously bright reds on two sides and happy pixels of harmonious pink, red and blue on the other two, The London Mastaba, in fact, was quite lovely to look at. The red contrasted beautifully with the green of the trees and the blue of the waters of the lake. 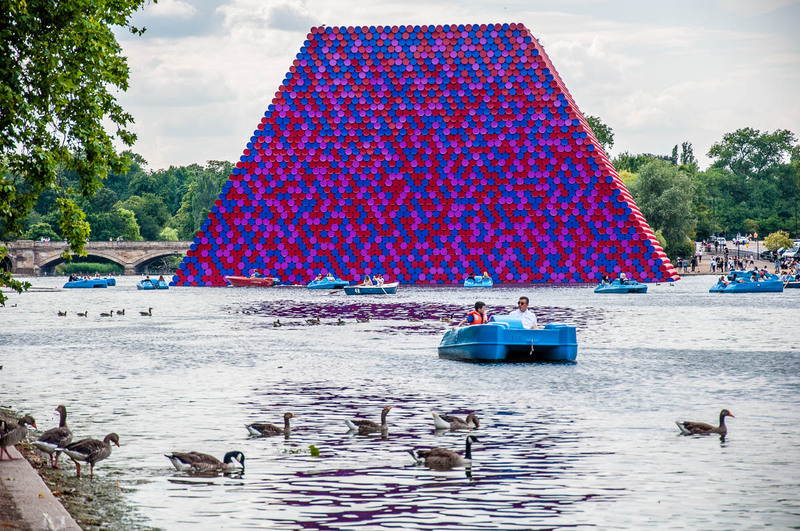 You couldn’t help it but look at The London Mastaba, even stare at it, waiting for something special, extraordinary to happen at any minute. I almost wished for a bunch of stunning fireworks to erupt from its flat top or for its many barrels to slowly start slipping down the red slopes one by one in a harmonised display of a perfect showmanship. 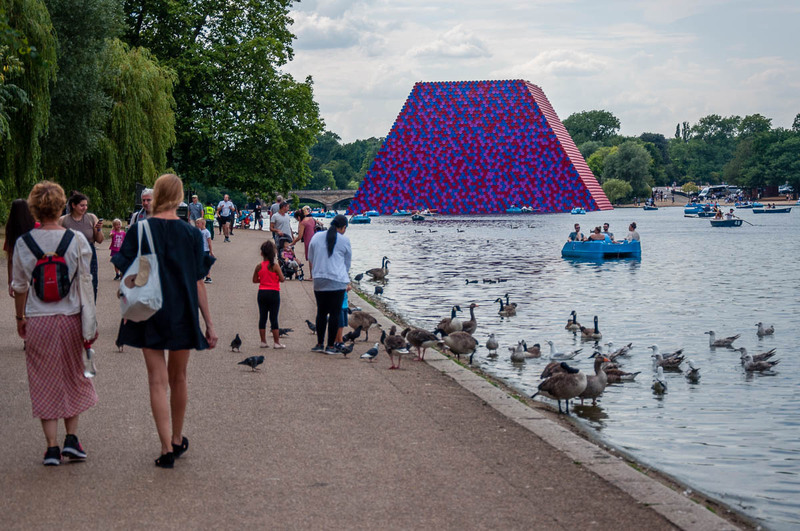 Nothing happened though and The London Mastaba continued floating on the Serpentine lake, perfect in its truncated shape and yet leaving us all quite baffled as to what it really meant. In fact, it could have meant everything and anything at the same time. Christo refuses to assign a meaning to the works he creates. It’s part of his dedication as an artist to being free. Born in Bulgaria he escaped to the West in the 50s of the 20th century. Freed from the restrictions that communism applied to art and artists, he went to become (together with his late wife Jeanne-Claude) one of the world’s most well-known and most daring artists creating temporary installations which get people talking and wondering, and thinking, and believing that anything is possible. It is quite the achievement in our fickle world, where people die hard for five minutes of fame, to be able to still produce wonder and questions in the heart of the spectators. 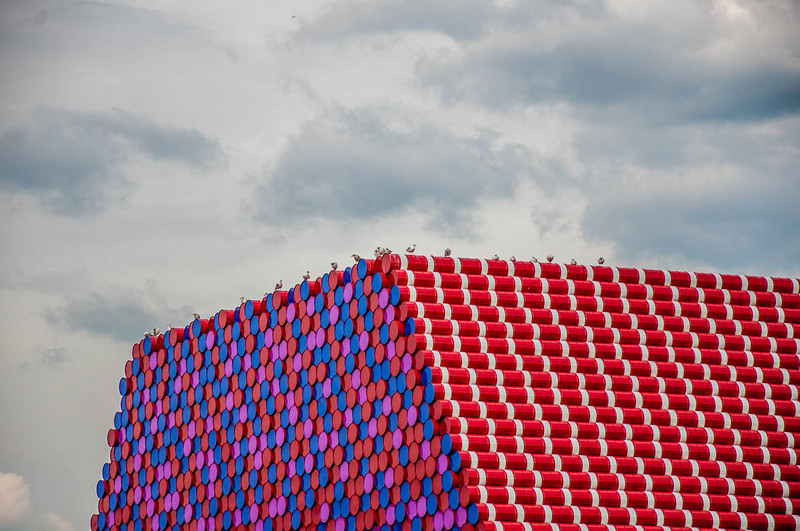 For this is exactly what we were with regards to The London Mastaba – spectators. We couldn’t interact with it like with The Floating Piers. We could just admire it from afar, trying to apportion some sort of meaning to its huge 600-ton body plonked in the middle of a lake. Apparently, the original mastabas used to be benches that people in ancient Mesopotamia would place in front of their homes. Later on, the mastaba’s particular shape was replicated in the design of the earliest tombs of the rulers of Egypt. It must have been nice sitting on these flat benches, legs supported by their sloped shape, and enjoying the evening breeze while chatting away with the neighbours after a long day. 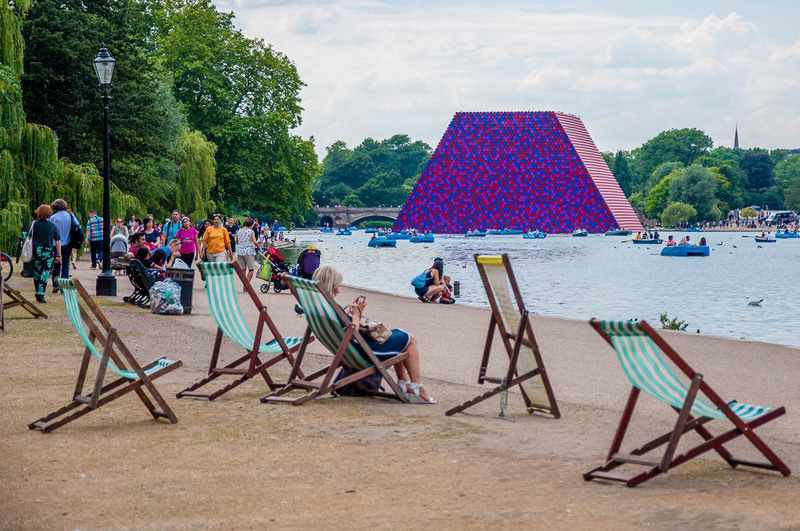 So, I imagine this huge red, pink, blue and white mastaba to be just that – a bench on which the World symbolically sits at one of the most famous spots on earth, namely London’s Hyde Park. The World sits on its bench made of barrels and wonders when this makeshift structure that people made for themselves, this dependency on petrol and gas will come tumbling down one barrel at the time. Obviously, this is all in my head. 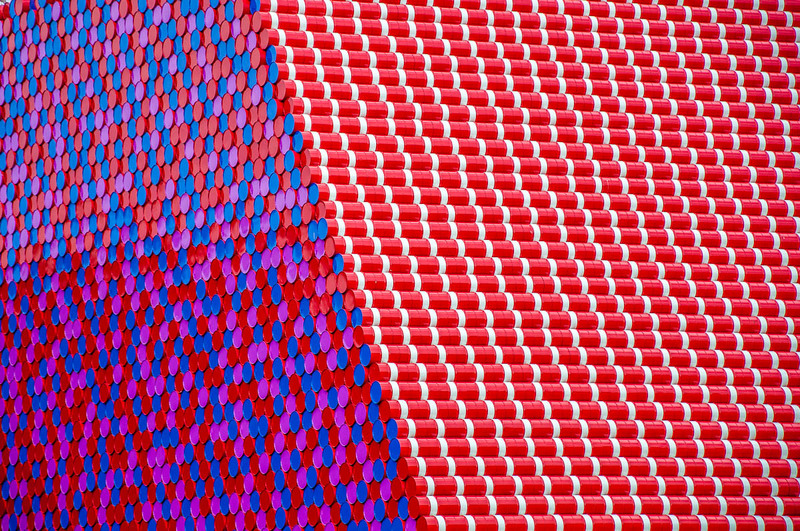 The real London Mastaba in front of us is not disintegrating any time soon. In fact, if you see the sturdy metal skeleton on which it is built (have a look at this gallery here), you will appreciate how strong the structure is. 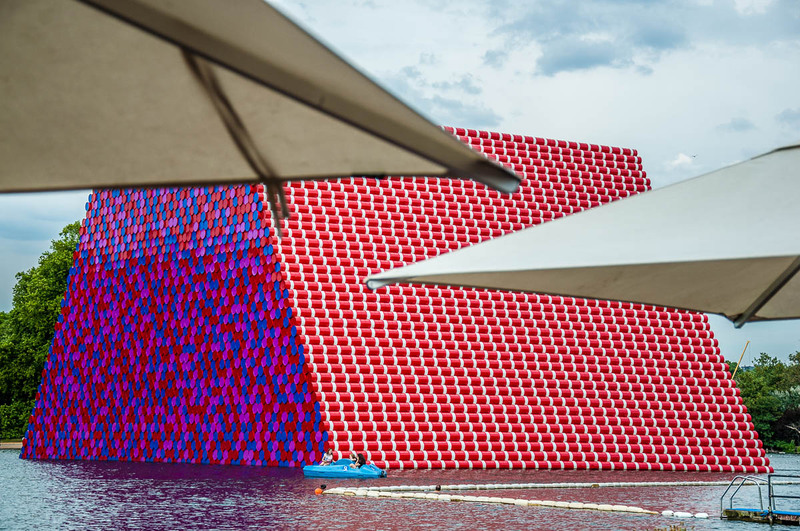 I found it quite funny that the Serpentine Swimming Club (you can see the swimming rectangle cordoned off in one of the pictures above) wanted reassurance that The London Mastaba would not interfere with the enjoyment of their swimming. It is quite incredible how proprietary people can feel with regards to places they go to on a regular basis. 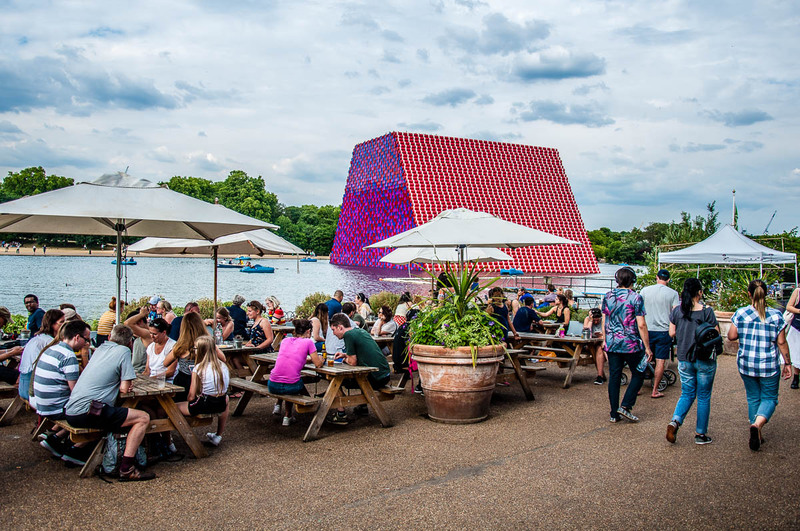 Anyway, The London Mastaba is there in the middle of the lake and we sit in the Serpentine cafe for a few minutes with a cold drink to admire it and chat. 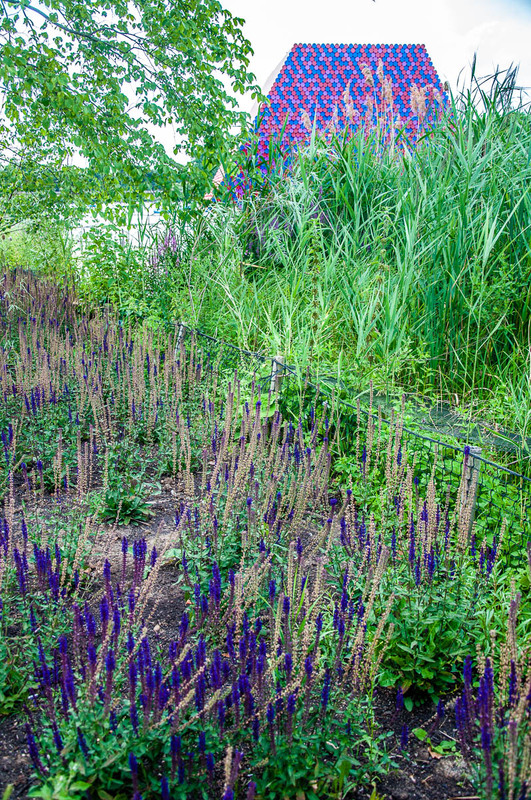 We leave earlier than we expected, as our little child – tired after a very hot day – throws an almighty tantrum. Later on, I would realise that we missed visiting the adjacent Serpentine Gallery where an exhibition of Christo and Jeanne-Claude’s barrel-themed works is on. By coincidence, Christo was booked to give a talk on the same summer evening we were there. But we missed that, too. Parenthood above art. 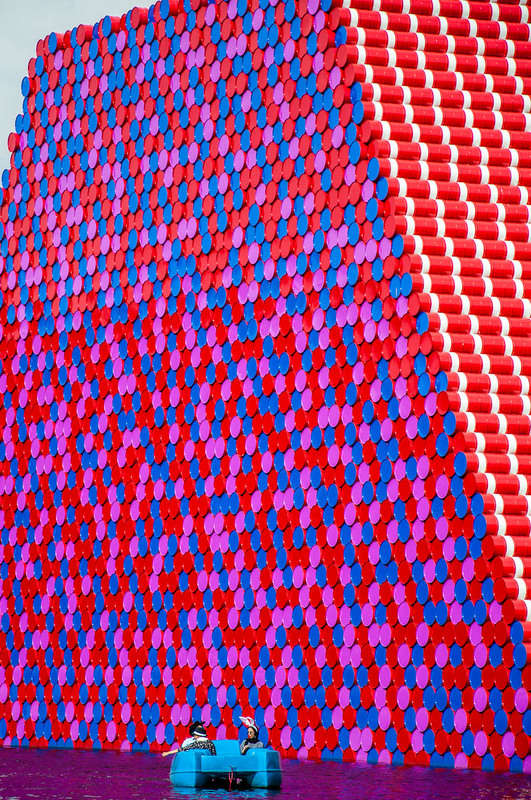 Missed opportunities or not, I am glad I saw The London Mastaba for myself. It’s the third Christo’s work I have had the chance to see in the last two years (The Floating Piers being the first and the second being a piece of art in the International Gallery of Modern Art in Ca Pesaro in Venice). I hope to be in the right place at the right time to see his next installation. Life will tell. 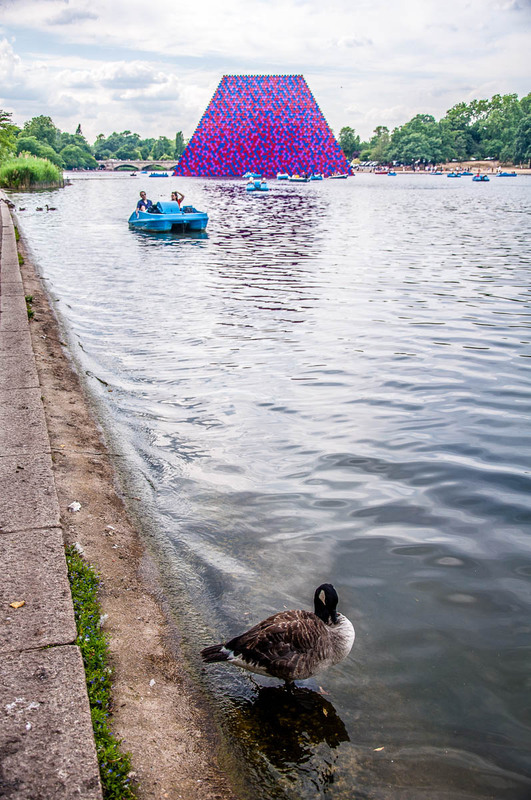 Have you seen any of Christo and Jeanne-Claude’s projects yourself? What were your emotions and thoughts when faced with it? Please, let me know. I thouroughly loved this post! My nephew works and writes for Christo. He also worked with his late wife. He has had amazing experiences with them and I’m so very proud of him. I’m going to forward this to him; I’m sure he will enjoy your post as well. Christo’s last book has my nephew Adam’s writing if you are interested in looking that up for more info. I was thrilled to see this; thanks for sharing. What a wonderful comment! Thank you for it! I wrote this little piece mostly for myself to remind me in years time of the opportunity of seeing Christo’s work. When I was growing up in Bulgaria we didn’t know anything about him and his art. It was only in the 90’s of the 20th century, after the Fall of the Berlin Wall, when his name started to be mentioned more and more. At the time, I couldn’t quite understand what he was doing, I even found it difficult to imagine the reasoning behind it all. I am so glad I had the chance to see some of his works in person, especially the Floating Piers. Walking on water – such an uplifting experience! Your nephew is very fortunate that he can see it all from so close. It must be really inspiring! I will definitely look for the book and his writing!